Ever dreamed of a tub of salsa? 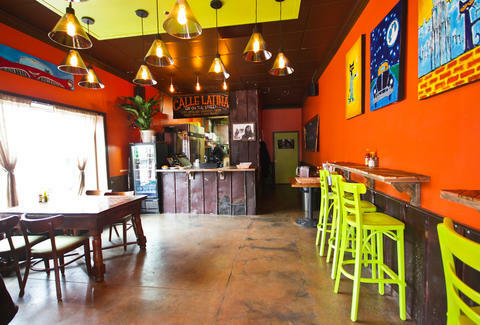 Then you 1) may have unresolved issues stemming from a childhood trip to Puerto Vallarta, and 2) need to check out Calle Latina immediately, 'cause they got one. 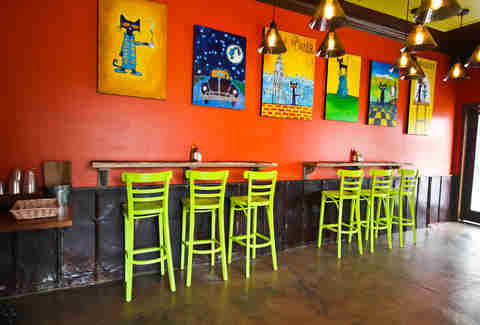 Full of handheld nosh like empanadas, tortas, arepas, and tacos, Calle's done up bright in the tradition of South America's street-food huts, and features trippy-eye Pete the Cat paintings from ATL artist James Dean not in the tradition of South America's street-food huts. 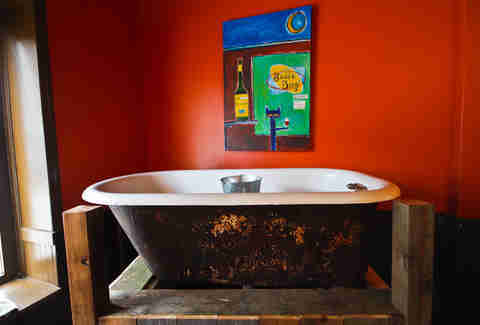 Here it is: a tub that gets filled with ice, which surrounds buckets, which in turn contain the salsa. Just 'cause. 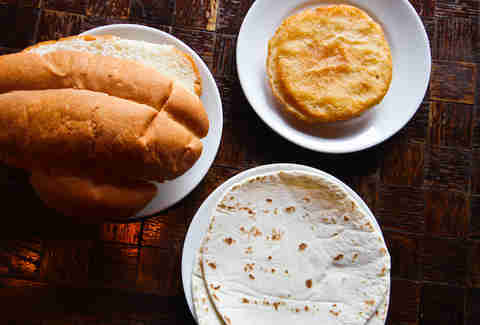 Everything on the menu can be done as a torta, taco, or arepa. 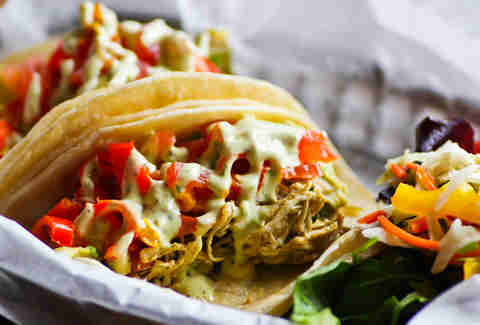 And there's even a gluten-free option for the health-conscious consumer of South American street-food. 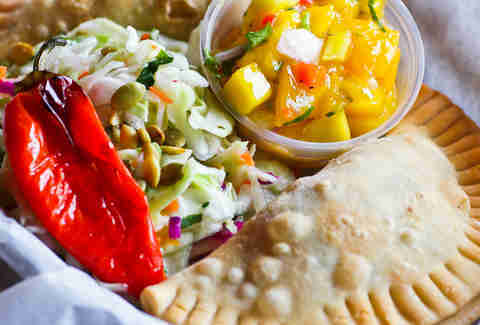 Empanada offerings range from braised pork shoulder with caramelized onion and chipotle BBQ sauce to The Cangreho with lump crab. 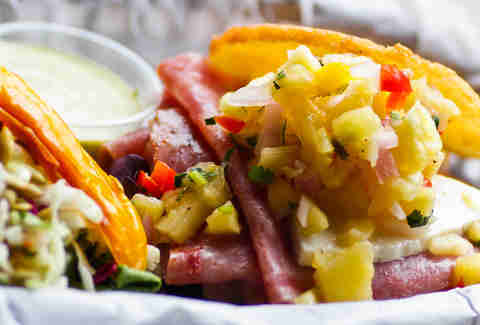 This 'repa's called The Hawaiian, and ensures you'll look terrible in a grass skirt thanks to grilled ham, Swiss, and pineapple salsa. The La Reina taco coats pulled chicken with green mole, avocado, tomato, and peppers. 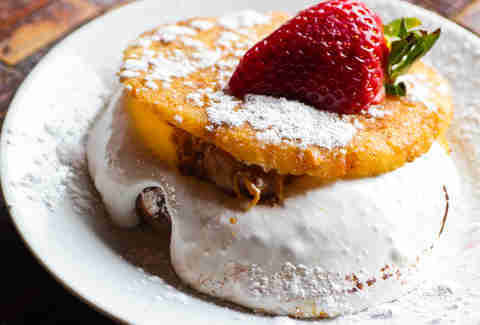 And they've even got your sweet tooth on lock with dulces like traditional tres leches, chocolate flautas, and this Fluffer Nutter arepa with marshmallow fluff, Nutella, and peanut butter -- perfect if you want to be as tubby as your dreams.